Nokia's CEO, Stephen Elop, posted a tweet highlighting one of the positive impacts of the recent acquisition of earthmine. 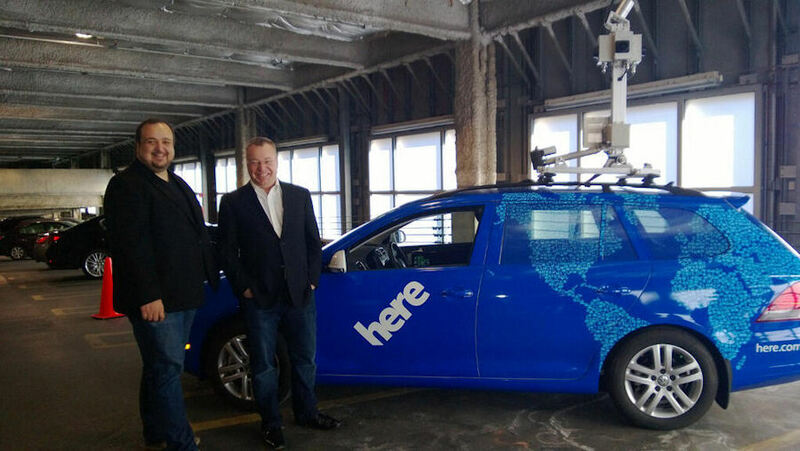 In an attached photo Elop is show standing, with John Ristevski, next to a HERE branded car that is used for collecting high resolution stereo panoramic imagery. Ristevski was previously the Founder and co-CEO of earthmine and is now Head of Reality Capture and Prcoessing at Nokia. The car in question is a re-branded version of earthmine's Mars Collection system, which was designed to collect 3D street imagery. Nokia has previously announced that earthmine's reality capture and processing technologies will become integral parts of HERE's 3D map making capabilities. High resolution panoramic imagery and 3D point data for every pixel. 32 megapixel 360°(H) x 180°(V) stereo panoramic imagery. Wide angle 360°(H) x 165°(V) 3D Data Capture. Up to 8 million 3D points per image and 24 million points per second (scene dependent). High accuracy global position and orientation sensors. Self calibrating metric cameras for robust field operation. Easy to use earthmine Capture Control software for controlling data collection. Flexible mounting system for deployment on vehicle or pedestrian platforms. There's also a version of the system designed for use in pedestrian areas, comprising the same capture system, but mounted on a recumbent bike. It is described as being" ideal for the collection of parks and gardens, college campuses, bike paths or walking paths, plazas and large indoor areas such as shopping malls, airport terminals and train stations". These vehicles and the associated collection and processing systems are distinct from the Navteq Tru vehicles that Nokia already uses to collect mapping data. The Tru system, which is placed on top of a vehicle in a similar way to the earthmine collection system, combines a LIDAR system, multiple panoramic cameras, and positioning (GPS and IMU) sensors.